I have four daughters and combing hair for my younger two is D-r-a-m-a, daily. You would think I am torturing them with the amount of commotion that goes on from the youngest, Miss Montana (who has been known to hide the comb during hair time). Now, my girls have a nice texture to their hair, no complaints there, but they all have A LOT of hair! Hmmm, where could they have gotten that from???? 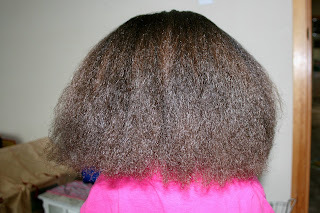 I have been known to break a few combs and brushes from the sheer volume and thickness of my hair. 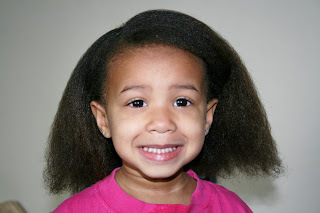 Today I decided enough already, let's make mommy's life a bit less stressful and straighten her hair with the hot comb on the lowest setting just to get the tangles out(not looking for the super straight hair that her sisters like). She sat peacefully for a bit while I did my work, gazing at herself with the handheld mirror. The whole process took about 45 minutes and I even trimmed off her dead ends. She loves her hair now, tossing her head side to side, shaking it, even combing it herself. The comb glided through her hair like butter, just the way mommy likes it, No tangles, No tears. I thought no one could ever empathize with me having to do hair for 3 girls but I have found my match in you.